British riders set world records as they take gold medals in the men's and women's kilometre time-trials at the Para-cycling Track World Championships in Mexico. 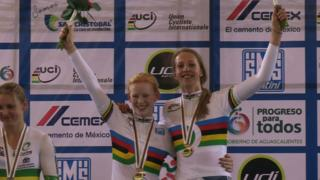 Sophie Thornhill and pilot Rachel James clocked one minute 5.912 seconds to win the women's race in Aguascalientes, while Neil Fachie and Pete Mitchell won the men's event in 59.460 seconds - the first sub-one minute tandem kilo. Jon-Allan Butterworth claimed bronze in the C5 4km pursuit to take the GB medal tally in Mexico to four.